يسر قاعة المسار للفن المعاصر, تقديم المعرض الفردي الأول للفنانة الشابة و المتميزة “ أسماء النواوي(1981) “, بعنوان : ميتولوجيا… يضم العرض أعمالها الأخيرة المستوحاه من الأساطير المتوارثة منذ قديم الأزل مثال : العروس الورق و السحر الأبيض , الحياه و الطبيعة, في تكوينات رائعة ت مجموعات لونية جذابة و التي تثري الأبداع و التعبير الرومانسي لدي الفنانة و الذي نراه بوضوح في أعمالها الأخيرة.. . In each painting there is a group of figures interacting with the Paper dolls, and surrounded with number of symbols and ornaments. One of these symbols is the wild bird, which belong to the Persian Islamic culture. These wild birds are symbol of the difficulties human beings face in life. The plant ornament is another symbol can be found in the paintings. They refer to all the people and things which look appealing, but they are harmful. That is because this plant ornament, which also belongs to the Persian culture, is a harmful plant. The last symbol can be found in the paintings is the maze, which is a symbol of life. In my opinion, life is more or less like a maze. It seems difficult to face all its challenges without losing hope, but finding a purpose for your life would help you in achieving a reason to live. So finally, guarding your old paper doll can be a purpose of living. As usual, I got the idea of these three paintings from a novel ‘The alienation of Jasmin’. The author gave the perfect description of the Arab women, by describing the jasmine flower. She shows us the similarity between both of them. All types of jasmine prefer to grow in a sunny place, but it can grow normally in the shade. It is a plant that does not need so much care. Jasmine flower can be satisfy by only one batch of manure in the spring each year, and It is a self-sustaining plant just a wet soil can make it grow . Arabic women were raised to feel content with the few of everything, In order to be the good girl as supposed to be according to some social standards. Asmaa was born 1981 in Cairo, Egypt where she currently lives and works. Studied visual art at the faculty of fine Art, and granted her Master’s degree and PHD on the relevance of the expression of symbolism, ornaments and human figures in Art. Asmaa is currently a professor and lecturer at the faculty of Fine Art Fine since 2002 until today. Al Nawawi also granted the ‘Egyptian National Award for Innovation’ prize in 2014, Followed by a distinguished scholarship in Rome, Italy, in 2015, where she continued researching and developing her Art more at depth. The Artist finds each one of her paintings more like a research, or a project, where she plunges into the world of symbolism and ornaments while using the cumulative symbols & concepts to create an artwork that which is more composed of riddles needing to be solved. Asmaa succeeded in making her own visual pictorial language of her own expressionism. She aims to heighten the viewer’s perceptions by involving them in the subtleness and the beyond meanings of each ornament, symbol and human equation which are always incorporated in her paintings, thus creates an amusing and distinctive dialogue in visual and emotional language and style, mostly featuring Human figures , their reality, thought, and dreams. 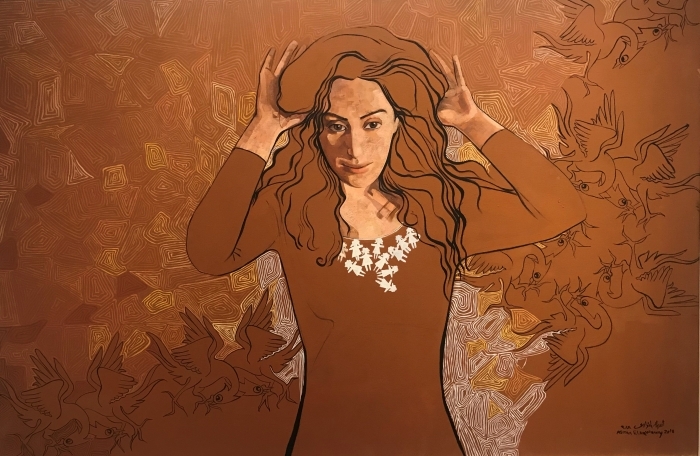 Asmaa Al Nawawi’s works have been exhibited in many group Exhibitions both in Egypt, the Middle East and Europe.